Inks and food dyes can be separated out into their individual pigments. 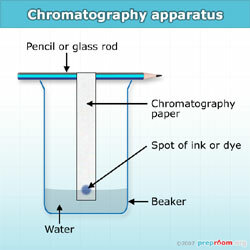 Chromatography is the method used to separate mixtures into their individual parts. 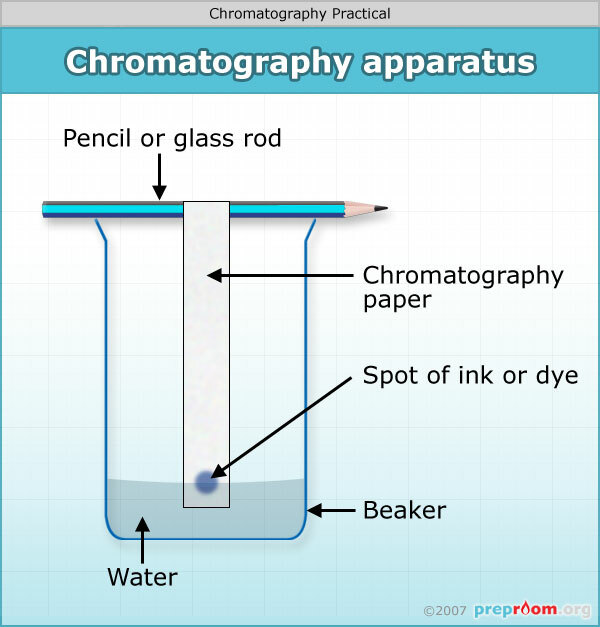 Colour chromatography has been used in schools for many years to demonstrate how inks and dyes can be separated out into the different pigments which make them up. Different coloured inks or food colourings work well. Sweets such as Smarties or gobstoppers contain vivid colourings in their coatings. These can be removed using a clean paintbrush and painted onto a strip of filter or specialised chromatography paper. Ink from felt tipped pens can also usually be separated effectively. Water soluble inks and dyes can be separated just using water in the beaker. Insoluble inks can be separated using ethanol or propanone. Chromatography paper can be purchased in rolls from most lab suppliers however strips of filter paper work just as well. Students paint a drop of coloured ink or dye onto the paper about 2cm from the bottom of the strip. The paper is then attached to a pencil or stirring rod and hung from the rim of a beaker. The beaker needs to have water (for soluble dyes) or ethanol/propanone (for insoluble dyes) in the bottom which should be just below the ink level. Over time the paper should soak up the liquid, taking with it the different pigments that make up the dye. When the liquid level has reached the top of the paper, it can be removed and dried. Each coloured ink or dye will produce a slightly different spectrum which represents the different pigments present in the ink or dye.